One of my favorite genres of classical music is the overture. Overtures are musical compositions that precede an opera or ballet. They are a way to introduce the many great themes of music the theater goer will hear in the ballet or opera. In the Romantic era of music a new kind of overture was developed called concert overtures. These are stand alone symphonic concert pieces of one movement that do not have a ballet or opera that follows. They are program pieces as they are given names or titles and the music that follows has a certain character developing a mood or story [without words] that the name of the overture conveys. While the operatic overtures are music that opens the opera, concert overtures are music that opens the concert program to follow. So, if you go to a symphony concert that has a concert overture as one of the pieces, you know almost surely that piece will be the first piece to be played. These one movement pieces are a perfect way to open the concert as they get the audience ready for the longer symphonic pieces to follow. Plus, they are usually very melodic. I love concert overtures. One of the first concert overtures may have been Felix Mendelssohn's "A Midsummer Night's Dream". The child prodigy wrote this concert overture at the incredible young age of 17. What a beautiful and mature piece of music for anyone to write, much less a teenager. Don't get this confused with Mendelssohn's overture for the play "A Midsummer's Night Dream" [in which Mendelssohn added incidental music to the overture to complete the music for the play--that incidental music contains the famous Wedding March]. 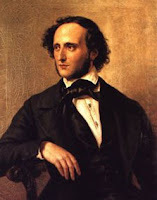 Mendelssohn wrote some other great concert overtures, as did Carl Maria Von Weber and Hector Berlioz. Later in the Romantic era, there were some great concert overtures composed by Tchaikovsky and Brahms, among others. What a way to open a concert program. I thank the Romantic masters for developing the concert overture, bringing concert goers some great music to open up a symphony concert program. Two of my favorite concert overtures are 1. the aforementioned Felix Mendelssohn's Midsummer Night's Dream concert overture and 2. Mendelssohn's Hebrides overture [also known as Fingal's Cave]. Johannes Brahms composed two great concert overtures: 1. his Academic Festival Overture [which is one of my favorites] and 2. Tragic Overture. In 1844, the French composer Hector Berlioz wrote a stand alone overture called Roman Carnival Overture. The great Ludwig Van Beethoven's Egmont Overture was originally composed to begin Johann Wofgang von Goethe's play "Egmont" but it has developed and become more popular as a stand alone concert overture. Note: The Egmont overture video below is conducted by the late great Maestro Lorin Maazel, who [in one of my great thrills in being on twitter] followed and tweeted to me and even sent me some direct messages on twitter. I was very sad to hear of his passing in July of 2014. May he be resting in peace with God in heaven. Please turn up the volume and enjoy these stand alone concert overtures that you may hear to open up a classical music concert program.